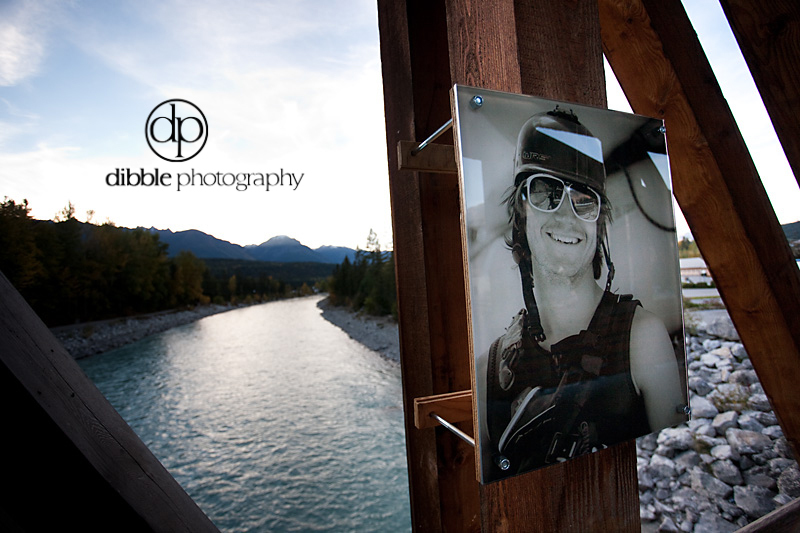 The images from the Kicking Horse in Me project will be coming down tomorrow. The response was quite positive, and it was encouraging to see that vandalism didn't join the party. When we hung them on the pedestrain bridge a month ago, I suspected that they may not survive the first night, let alone a full month. The fact that they did survive without being ripped down or defaced is a strong sign that the town of Golden is ready for more outdoor exhibits of artwork in public places. This excites me. There were a few things that I really enjoyed about showing these pieces in an unexpected venue. The first was spending long stretches of time on the bridge, both putting up and taking down the exhibit. It's a heavily used bridge, by locals and tourists alike. So many faces passing through of all ages. The second thing I loved about the show was seeing the river not only behind the prints, but also reflected in them across the bridge. At this time of year the Kicking Horse is a vibrant blue, and the colors bouncing off the black and white prints was a lovely contrast. And third, it was a great pleasure to spur others to consider alternative exhibit spaces. A few folks out there seemed inspired to show their own work outside of regular galleries, and I hope they will.